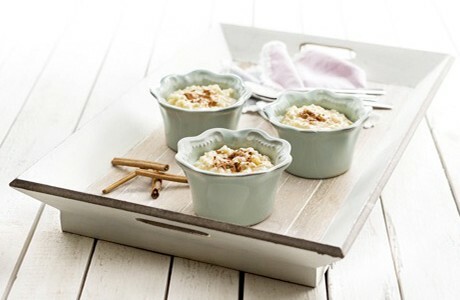 This Portuguese dessert is a delicious twist on the classic rice pudding. Served cool, and sprinkled with cinnamon, this recipe is perfect for those special occasions. Pass the rice briefly under cold water using a strainer. To a pan, add 900ml of water with a pinch of salt and the rind of half a lemon. Once the water reaches a boil, add the rice. When you run out of liquid, add a third of the milk. Then add the yolk and a little more milk. Gradually add more milk slowly as the liquid evaporates. Once all of the milk has been added, add the sugar and butter. Stir for 45 minutes to 1 hour over a low heat until creamy. Let cool, sprinkle with a little cinnamon and serve at room temperature.